During the 4-year break between releasing albums, the members of indie-pop band Guster took a break from their strenuous touring schedules to pursue other projects of great interest to them, including having children, contributing music to films, building home studios and, in the case of Adam Gardner, promoting the works of his environmentally-oriented not-for-profit organization (called Reverb, which is "dedicated to greening musicians' tours and engaging their fans to take action to protect the planet"). When they re-grouped in late 2008 to begin work on their next release, they'd hoped to be able to record some new songs rather quickly, but a variety of roadblocks - including having to fire their original producer and leaving their long-time record label (Warner Brothers) for a new one (Universal) - forced the band mates to do an in-depth appraisal of their future together. A meeting in a Brooklyn bar made them realize that they all wanted to move ahead and, rather than focus on pressures from the record label and on "making hits", what they really wanted was just to pour their souls into making a record they could be proud of. 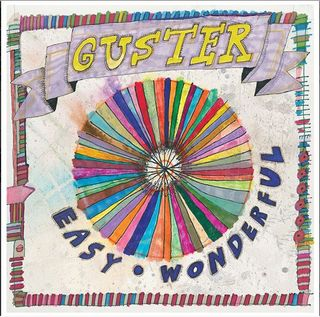 The result was their well-received 2010 release titled Easy Wonderful. Once the record was done, though, they were eager to get it out to the public and, with a shortened production schedule, it was time to find an artist and create the designs for the packaging. 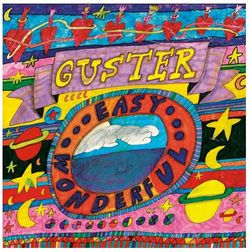 Guster drummer Brian Rosenworcel then showed his good sense of timing when he asked an artist whose work he'd recently added to his own art collection to produce something wonderful for the cover. "My wife's ex-step-mother has a niece who was Chad Carlberg's boyfriend. I met Chad at a family gathering and he told me that his sister went to med school with Brian Rosenworcel's wife and that the two of them became friends after that. Chad liked my work and asked me to work with him on a couple of projects. I did a TV commercial that I was the star of and also did some art that he animated for a music video. About a year ago, Chad introduced me to Brian, who was a fan of my work, and they asked me to work on the album cover art for their new record. Since Brian was familiar with my work, he was able to sell me to the other band members. They all thought that my kind of art would go along well with the vibe of what they were doing musically. The band gave me an advanced copy of the CD, so I knew what their stuff was like. The music had a very "feel good" vibe - very "pop-py". I knew that this would be an ongoing collaboration, and so by listening to the songs on the album, I hoped to portray visually what each song and the whole album was about.” I decided to go with a circle because CDs are circular. Also, I like bright colors, and since Guster is a sunny, optimistic band, I designed my art to reflect this feeling. I just listened to the music and riffed a lot on my own and, once the band saw my stuff, they gave me some feedback. I talked to Brian a lot while I was doing the art - I kept feeding him ideas and he kept giving me feedback. They didn't come up with ideas for specific images; I would show them something and they would let me know if it worked and then I'd give them others with the same feel. I kept giving them new things to look at and, eventually, they were happy. They were incredibly easy and fun to work with, so I never minded doing dozens of images and then re-working them to their satisfaction. It's a lot like advertising, really. Most of my contact was with the band itself - that is, I didn't really hear anything from the label people. Everyone was pretty cool during the time I was given (the money was fine, too! ), even Chad gave me some feedback (Editor's note - in a recorded interview in February, 2011 at New York's Metropolitan Museum on the subject - you'll find a link to this at the end of this article - the band members said that Jon basically works based on his own inspirations, so any suggestions are typically discarded quickly. 'John creates, then discards - he doesn't touch anything up'). Ryan Miller told me that I was the only artist that he knew of that just makes art and that he'd never seen a purer expression of art. Anyway, the whole job probably took 3 months or so. I didn't use any special materials. I know that I submitted dozens of images and they were all scanned and given to the A.D. at the label. The artwork that I thought I had done originally for the CD label wound up as the main image on the cover. After the scanning, the A.D. then PhotoShopped together 3 or 4 images from different art pieces to arrive at the final image for the cover. I’m really happy with what he did. He really got my sense and didn’t have a heavy hand at all. I also did all of the lettering and the lyric sheets, the inside illustrations, the back cover, the liner notes, and designs for the labels on the CD and vinyl LP. Many of the other images are used on their stage props and their merchandise. Other ones were used on their singles, T-shirts, sweatshirts, water bottles, scarves, knapsacks, Brian's bass drum head and then all of the painting during the music video for "Do You Love Me?" The band told me that this was the first time that they used their album art beyond just the cover - it's on the video and their website and their merchandise, too. To sum it up is simple. The band and their management and the label were - I mean are - great. They were very communicative about what they wanted, and they created an environment in which I really wanted to satisfy them." Guster hired film director Chad Carlberg to produce the music video for the album's first single, "Do You Love Me?" (in fact, the band produced music videos for every cut on the album). Knowing Jon and how he works, Chad decided that the best way to harness all of Sarkin's kinetic energy would be to feature it (and him) in the video. Using a technique where he recorded the band members playing as if they were doing it in slow motion, Jon then painted everything in eyeshot - the set, the band-members, I mean EVERYTHING - in real time, so when the edit was sped up to normal speed, it appears that the band is playing in regular time and that Jon is running around frenetically - a very cool and effective approach to representing both the players and the artist as you might imagine them. As a youngster in New Jersey, Jon Sarkin liked to draw and enjoyed visits to the art museums in New York City where he could see works that inspired him. He particularly liked Pop art - Warhol, Rauchenberg - and the Dadaists as well. Later on, he discovered the wild and crazy art styles of R. Crumb and Ralph Steadman, with these inspirations highlighted in his sketches and in the posters he would create for the dances at his school. While not all that athletically inclined, he did discover a liking for golf, a game which he'd take up again later on in life. A lover of the outdoors, the shy young chiropractor would often try to steal away from the office on a beautiful day to get in 9 holes of golf with his friends. It was during a round in 1988 that Jon suffered a sudden brain hemorrhage, followed by a post-surgery stroke that nearly killed him. While the stroke left him partially blind, deaf in one ear and with his sense of balance permanently affected, some unexplained force re-awakened his artistic talents. As author Amy Ellis Nutt states so elegantly in her article on Jon (see below), "the once-shy, ambitious chiropractor awoke with an effusive, unfocused need to create... He didn't approach the world anymore, the world absorbed him - overwhelming his senses, swamping the filters that protect the rest of us from the minor details of existence. Colors, sounds, smells, words and images produced a cacophony of sensations." Today, he lives and works in Gloucester, Massachusetts - in a studio based in an old converted fish factory - with his wife and his two daughters . As he puts it, "I mean, after all, my life has not sucked totally, and the whole art thing is pretty cool, don’t you think? And my kids are great. And my wife Kim, well, she ROCKS!" Sarkin has work in the private collections of Tom Cruise, Robert DeNiro, Annie Leibovitz, Meryl Streep and Diane Von Furstenberg. He has shown at Diane von Furstenberg, The DeCordova and Revolving Museums in MA, The Museum of Modern Art in NY and others (please visit his web site at http://www.jsarkin.com for more information). Jon has been featured in three BBC documentary films, an episode of ABC's "Medical Mysteries" and in articles in GQ, Vanity Fair, and Readers Digest, etc. As an actor, Sarkin has appeared in film and on stage ("I enjoy the work, but I really don't consider myself an actor"). Jon has also written many volumes of poetry and, in addition to a long list of art commissions, he is currently writing/illustrating both a novel and his own autobiography. His artwork is in the collections of The Museum of Modern Art in NY, the Decordova and Revolving Museums in MA, and private collectors including Tom Cruise, Annie Leibovitz, Diane Von Furstenburg/Barry Diller and many others. The rights to Jon's life story have been purchased by United Artists for a film to be developed by Tom Cruise’s production company. A script has been written and a director has been chosen. More details will be available on his site as they are released. At about 37:30 into the video, you can watch Jon produce a new version of the "color wheel" artwork while Guster plays cuts from the new record. All images featured in this UnCovered story are Copyright 2010 Jon Sarkin and Guster - All rights reserved. Except as noted, all other text Copyright 2011 - Mike Goldstein & RockPoP Gallery (www.rockpopgallery.com) - All rights reserved. DEAR JERRY: Who are the 10 artists of the past century with the greatest number of pop albums on the charts? How does that group compare to those folks with the most chart singles? Lastly, how many acts reached No. 1 with a single, but then did not get the opportunity to make an LP? DEAR MATT: The all-time Top 10, with their total number of charted albums, are: 1. Elvis Presley (105); 2. Frank Sinatra (78); 3. Johnny Mathis (72); 4. Ray Conniff (53); 5. James Brown (51); 6. Barbra Streisand (48); 7. Temptations (48); 8. Beach Boys (47); 9. Willie Nelson (46); 10. Beatles (45). As for pop singles, only 40% of the names on the previous list are carried over: 1. Elvis Presley (163); 2. James Brown (107); 3. Ray Charles (91); 4. Aretha Franklin (88); 5. Fats Domino (77); 6. Beatles (75); 7. Frank Sinatra (75); 8. Elton John (69); 9. Connie Francis (67); 10. Nat King Cole (66). James Brown once sang “It's a Man's Man's Man's World,” and so it goes with these two lists. Of the 16 total names, the only ladies are Barbra, Aretha, and Connie. The vinyl long-play format debuted in 1948, but the album Nazi (“No LP for you!”) appeared only during four years. By 1959 this strange and short-lived predicament came to an end. 1952: Johnny Standley (“It's in the Book”). 1955: Joan Weber (“Let Me Go Lover”). 1958: Danny and the Juniors (“At the Hop”); Elegants (“Little Star”). Two on this short list eventually had an LP of their own, but those came 20 or more years after their original success. Both 1958 groups, Danny and the Juniors and the Elegants, finally made it to long-play vinyl in the early 1980s. Johnny Standley; Joan Weber; and Danny and the Juniors did at least have seven-inch, four-track, extended play 45s, which are sometimes described as mini-LPs. DEAR JERRY: Until recently, I didn't know Patsy Cline's “Sweet Dreams (Of You)” was written by Don Gibson. I see he is also the composer of “I Can't Stop Loving You,” recorded by Ray Charles, Elvis, Roy Orbison, and many others. Did Mr. Gibson write these songs just for others, or did he release his own versions? DEAR BETSY: Yes, Don recorded his own versions of both of those tunes. However, in neither case did Gibson have the best selling record. Don's and Faron Young's “Sweet Dreams (Of You)” both came out in the summer of 1956, but Faron's became a far bigger hit. It didn't hurt that Young was an established star with a dozen Top 10 records to his credit, and Gibson had yet to have his first hit as a singer. Patsy Cline's classic version of “Sweet Dreams (Of You)” was her first posthumous hit, issued just a few weeks after the plane crash that took her life (March 5, 1963). Don's second hit, “Oh Lonesome Me,” didn't come along until 1958. It would, however, be worth the wait. It became his biggest ever, a smash in both the C&W and Top 40 fields. Not a lot of attention was paid to the B-side, a terrific ballad titled “I Can't Stop Lovin' You” (no 'g'). Four years later, Ray Charles' “I Can't Stop Loving You,” backed with “Born to Lose,” sold over a million copies — elevating writer Don Gibson to a higher tax bracket. Elvis, Conway Twitty, and others who recorded “I Can't Stop Loving You,” kept him there. IZ ZAT SO? Of all the versions of “Sweet Dreams (Of You),” the only one to reach No. 1 is by Emmylou Harris. That was on the C&W charts. Her 1976 treatment of the Gibson classic remains one of the biggest hits of her 42-year career. Two other significant waxings are by Tommy McLain, who had the biggest pop version (1966), and Reba McEntire (1979). FRANKLIN, TN - During the month of June, Naxos of America will launch distribution for three labels in the U.S. and Canada, with genres ranging from classical to audiophile recordings and UK roots and folk music. The labels included in this month's launch will be Navigator Records, Yarlung Records and K&K Verlagsanstalt. Navigator Records (navigatorrecords.co.uk) is the home to many ground-breaking artists on the UK roots and folks scene today. Since the label's inception in 2008, Navigator releases have received awards and nominations from the BBC Radio 2 Folk Awards and the Irish Music Awards. The regular and glowing reviews in the majority of UK music press (Q, Mojo, fRoots, Word, The Guardian, The Independent and many more) have made it obvious why Navigator is one of the most acclaimed new labels in the UK. The Roster of artists includes Bellowhead, Jon Boden, Boo Hewerdine, Faustus, Bella Hardy, Spiers & Boden, Chris Wood and many others. Grammy® Award-winning Yarlung Records (www.yarlungrecords.com) brings fresh musicians to the classical music world using minimalist audiophile recording techniques to deliver sound as close to live performance as possible. Rather than using recording studios, engineer Bob Attiyeh produces these albums in concert halls famous for their acoustics, including Walt Disney Concert Hall and Ambassador Hall in Los Angeles. Yarlung uses both analog tape and high resolutions digital media for CDs made with special alloys, high resolution digital downloads, and 180 Gram vinyl LPs, all mastered by Steve Hoffman. With repertoire ranging from the 11th century through the Baroque, Classical, Romantic, and 21st Century, Yarlung highlights performances of top soloists as well as superstar young musicians at the beginnings of their international careers. K&K Verlagsanstalt (www.kuk-verlagsanstalt.com), founded in 1995, is the publishing house of the German producers and artists Josef-Stefan Kindler and Andreas Otto Grimminger. Specializing in acoustic music, concert recordings and visual art, the label records outstanding performances and concerts for posterity. Through its recordings, K&K creates an atmosphere where the performers, audience, opus and room enter into an intimate dialogue that in its form and expression is unique and unrepeatable. This goes hand-in-hand with the label's philosophy of enabling the listener to acutely experience every facet of this symbiosis, the intensity of the performance.